Last year, my husband came up with big plans for our big trip this year. Like other trips we take, my husband plans the big picture and I fill in all the details. That means that part of his responsibility is taking care of the air travel and the hotels along the way. Through a very strange and weird twist of fate, the first part of our trip would see us flying Singapore Airlines Business Class from Los Angeles to Tokyo. We were excited when we were told that because we had Business Class tickets we now had access to the Star Alliance Lounge at LAX. It’s a good thing we arrived at the airport early enough to take advantage of our access to the Star Alliance Lounge at LAX. According to my husband, you need to have Business Class or above tickets for any Star Alliance member airline or you need to be a Star Alliance gold member. This isn’t the type of airport lounge that you can buy your way into with some sort of membership. 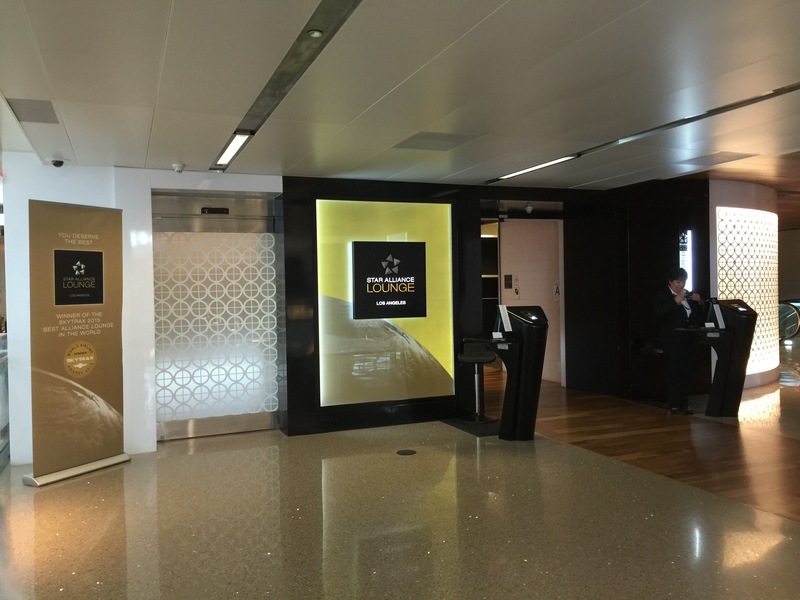 Entrance to the Star Alliance Lounge is given based on your current, or past purchases, of elite seats on Star Alliance airline flights. So we were so thrilled we’d be able to experience the lounge. 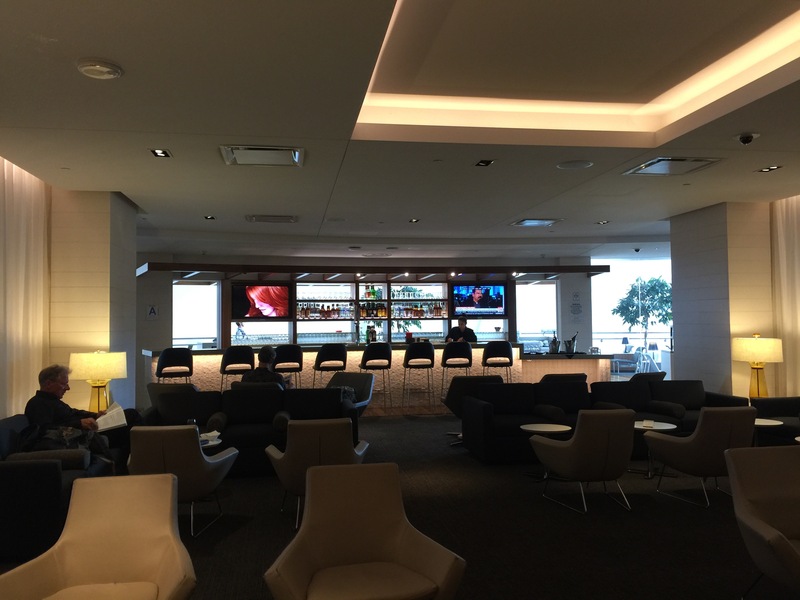 The Star Alliance Lounge is located on the top floor of the recently renovated Tom Bradley International Terminal at LAX. Once you show your boarding pass to gain access to the lounge and you walk through the doors, the space opens up into this enormous, comfortable lounge space that can easily fit hundreds of guests. The lounge consists of both indoor space, balcony space that is open to the terminal itself and looks out over the shopping arcade of the terminal as well as outdoor space that actually opens up towards Terminal 3 where you can watch planes come and go. Each unique space – indoors, outdoors, and on the balcony – each has its own fully-stocked bar serving every kind of drink imaginable that you’d want to order. 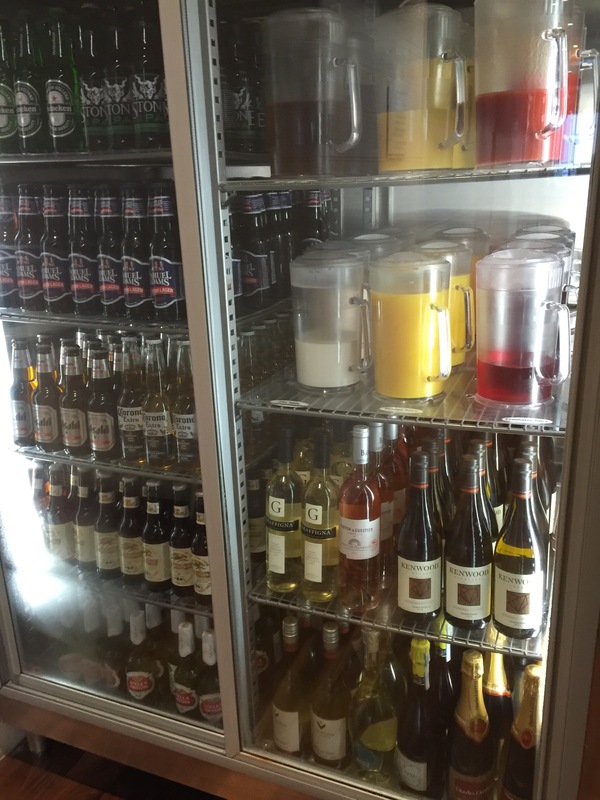 Of course, the bars aren’t the only places to get something to drink at the Star Alliance Lounge. 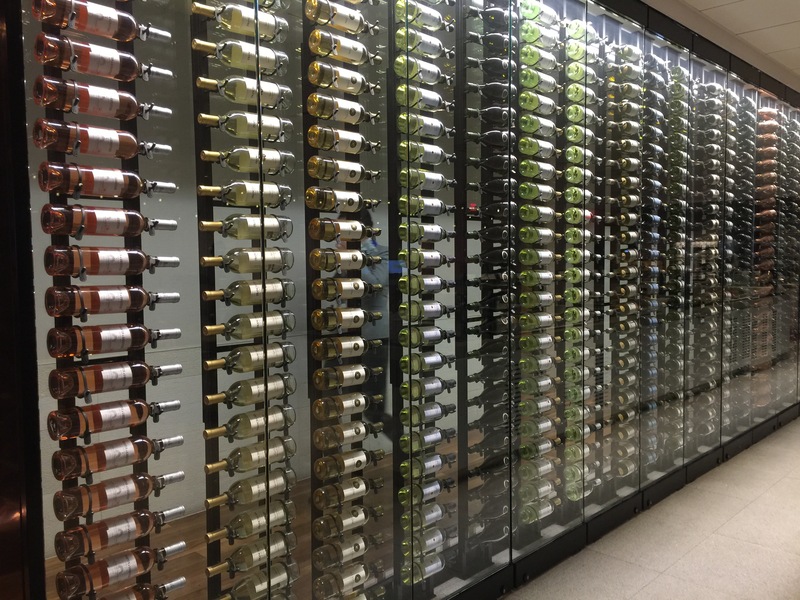 Along one wall of the food buffet area, there’s a glass enclosed wine rack that literally holds hundreds of bottles of wines. And near the back wall is a refrigerator filled with different types of bottled beer, fruit juices and chilled white and red wines, roses, and champagne. Bubbly for everyone! Help yourself. 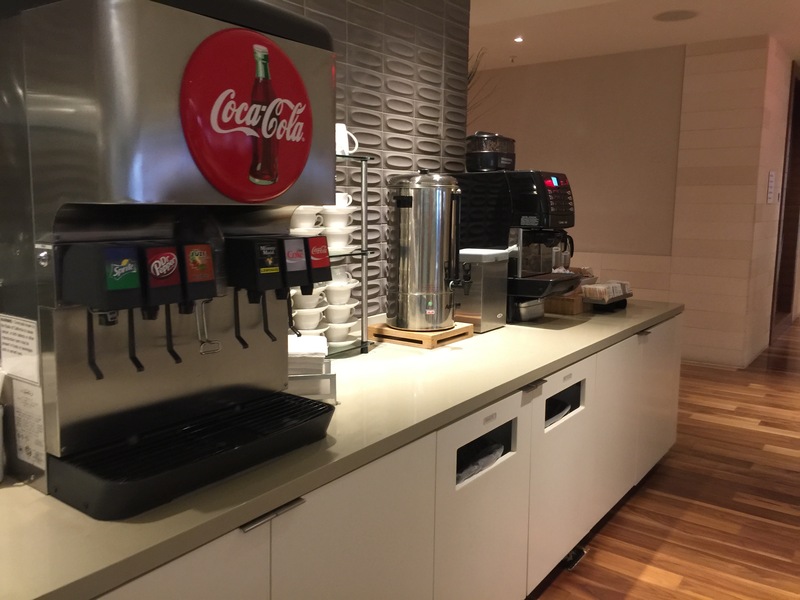 There’s also a soda fountain machine for those not interested in alcoholic beverages or juices. 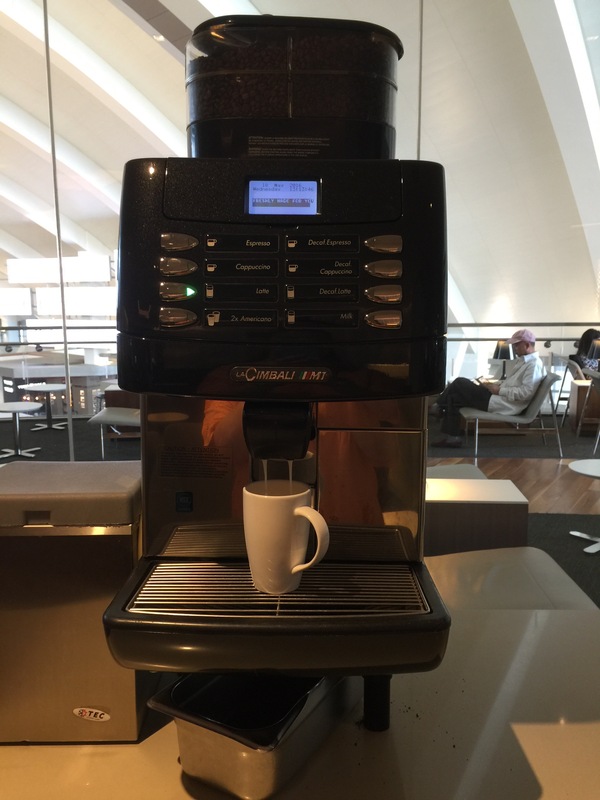 And sprinkled in several locations throughout the lounge are gourmet coffee makers for those who need a boost of caffeine before boarding their international flight. 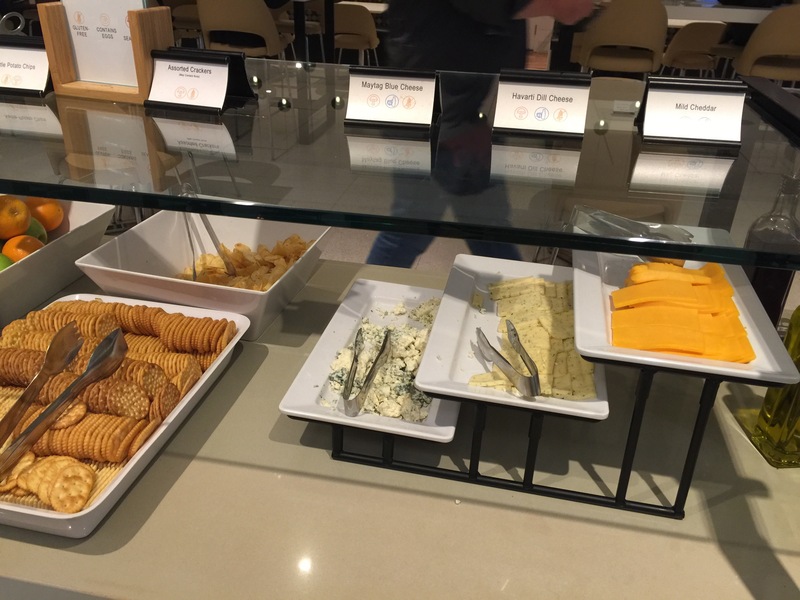 The food selection at the lounge was plentiful and abundant. Part of the food options started with on long buffet line. The first selections included a kalamata olive hummus and a red pepper hummus. Vegetable crudite was an option for the hummus with cherry tomatoes, celery, cucumbers and bell peppers. Next came some wraps and sandwiches. Mango and curry egg salad was an interesting and creative wrap and something different from just a regular egg salad. The sandwich was a roasted chicken sandwich. There were several different salad options to choose from. A fresh tuna salad with vegetables and a pasta salad with orecchiette and ham and finally a caesar salad with anchovy dressing. Next was cheese and crackers. Cheese options included mild cheddar cheese, Havarti dill cheese and Maytag blue cheese. Assorted crackers and potato chips along with assorted bread rolls were offered. 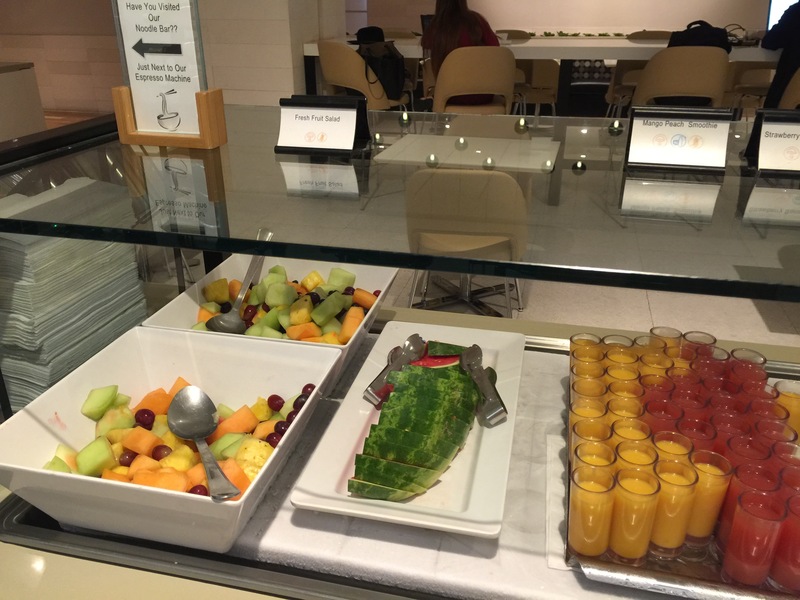 Also an assortment of fresh fruit included oranges, apples and bananas. 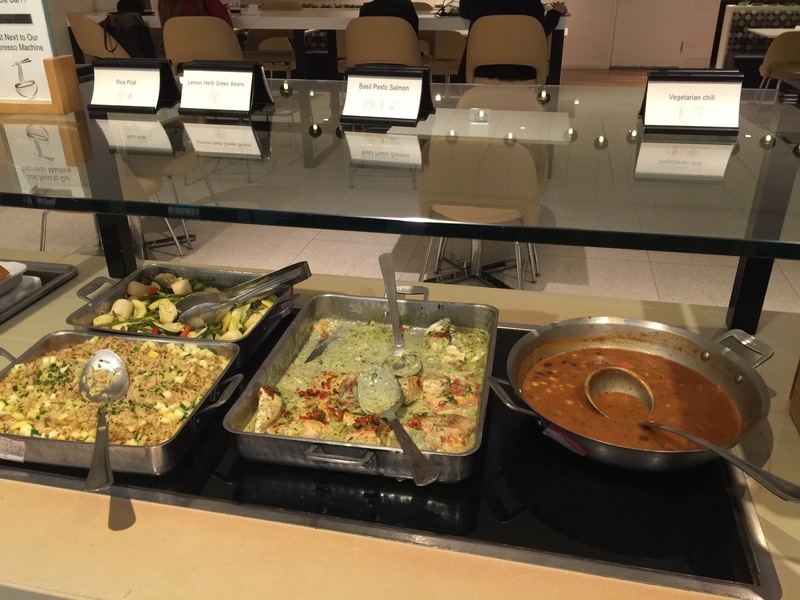 Finally, there was the hot food portion of the buffet. Vegetarian chili was the healthy soup option for the day. The entree offering was basil pesto salmon, which looked fantastic. And accompaniments included lemon herb green beans and rice pilaf. Who could forget dessert? There was fresh fruit salad and slices of refreshing watermelon. 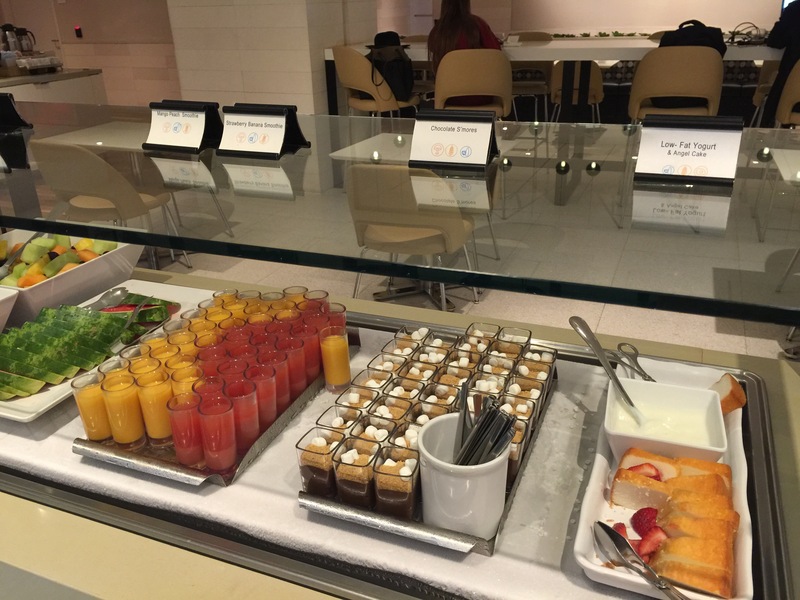 Additionally, there were two different kinds of smoothies to choose from – mango peach smoothie and strawberry banana smoothie. Believe me, my husband and I both had to try the smoothies and we loved them. They were so tasty. Also little chocolate s’mores shooters were a terrific sweet ending to a filling meal. A healthier option for dessert was low fat yogurt with angel food cake. 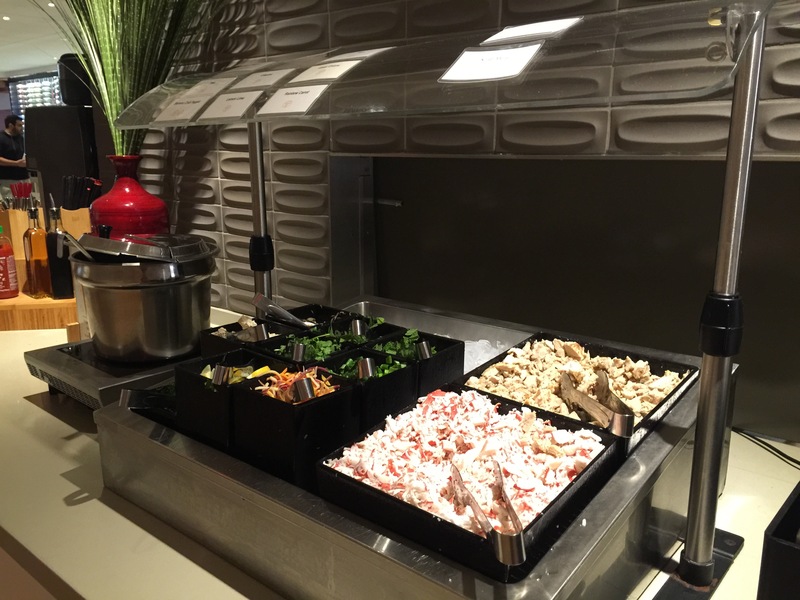 I mentioned earlier that this long buffet line was just one food option inside the lounge. Around the corner from this buffet area, was an entirely separate food area of the lounge that included an Asian noodle bar. This was my favorite section of the lounge. 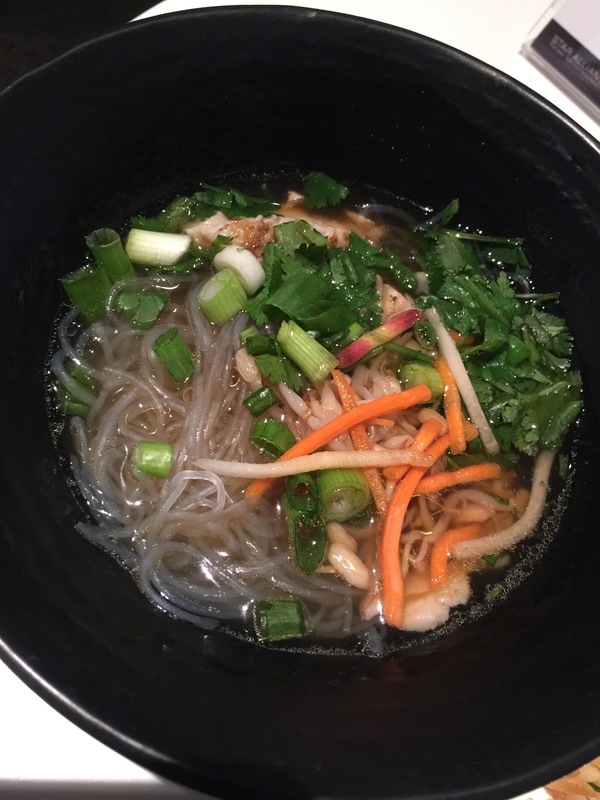 Grab a bowl and make your own bowl of noodles the way you want. First you start by choosing between two different types of noodles: mung bean noodles and wheat noodles. Then there are the toppings for the noodles. For protein, you can choose chicken or crab meat. Vegetable toppings included green onions, cilantro, rainbow chard, picked daikon and carrots, lemon wedges and chili flakes for a little spice. Finally, your noodles need some broth. 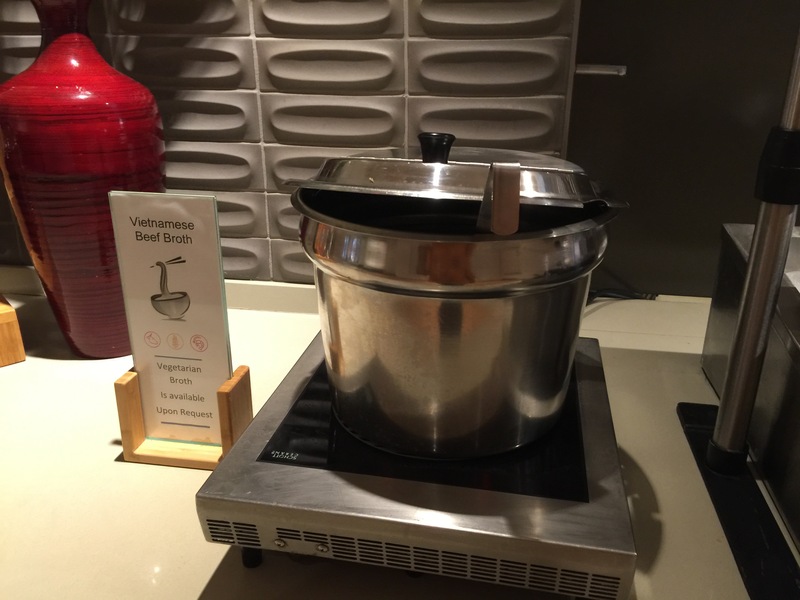 Next to the topping station was Vietnamese beef broth for the noodles. Add as much, or as little broth, as you wanted. Vegetarian broth was also available upon request. The last station was for spices and condiments to add to the noodles for extra flavoring. 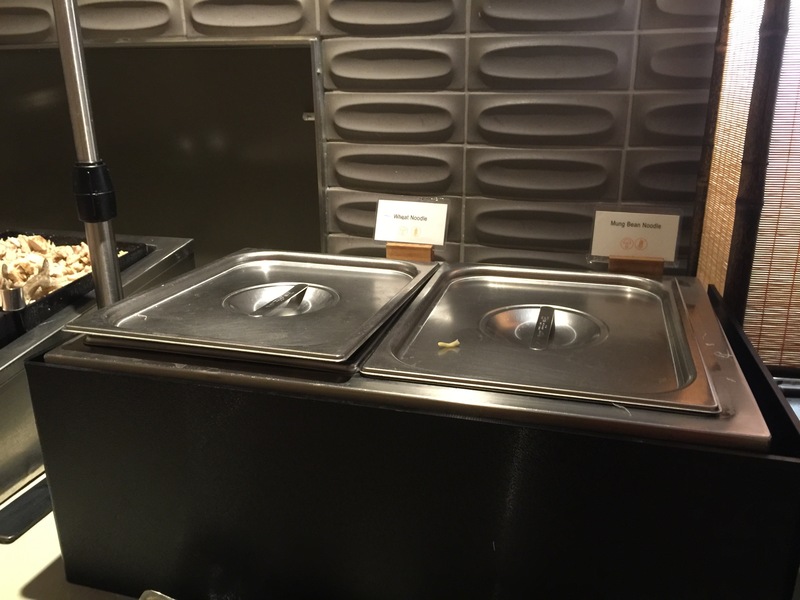 There was soy sauce, sriracha sauce, salt, pepper and other condiments. Add them liberally to your noodles as you choose in order to flavor the noodles exactly the way you want. As I said, this was my favorite part of the lounge. Mung bean noodles, a little bit of chicken, cilantro, green onions, pickled daikon and carrot, Vietnamese beef broth and a little bit of soy sauce made for one delicious and filling bowl of noodles that filled me up for lunch before our flight. You never know what you’re going to get when you board a twelve-hour long haul flight to the other side of the world. 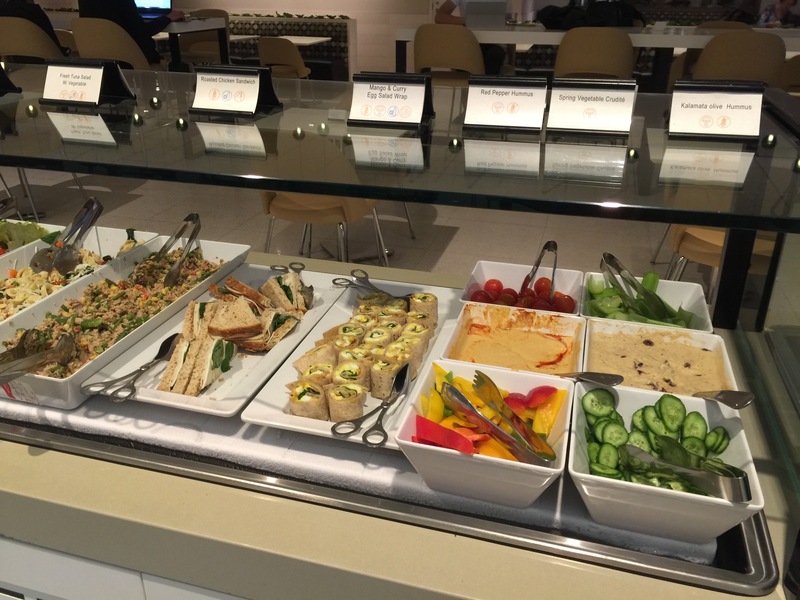 But, when you get the opportunity to rest, relax and have a good meal at an airport lounge before boarding a long international flight, you should definitely take advantage of that opportunity, especially if that lounge is the Star Alliance Lounge at LAX. 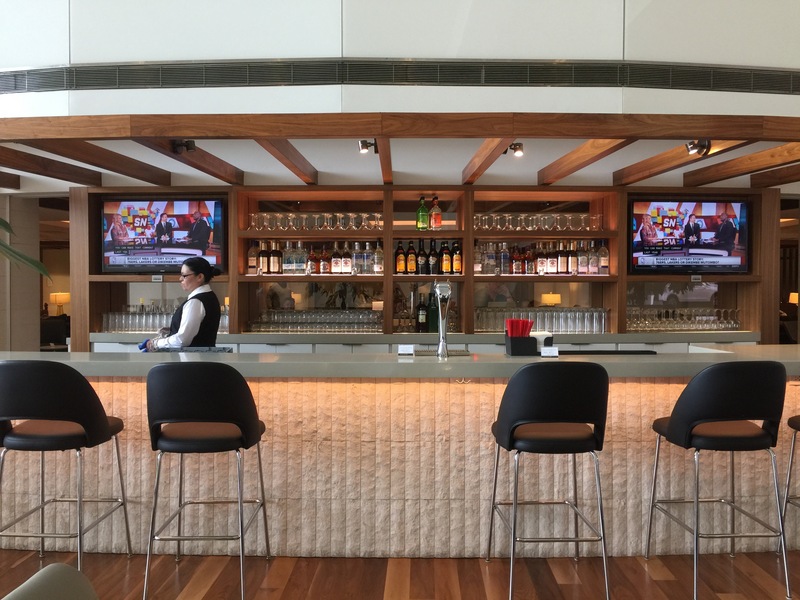 There’s a reason this is one of the most coveted lounges at LAX, its spacious, comfortable, relaxing, and offers a wide variety of food and drink to meet the needs of travelers who are about to board an international flight. It’s not just an abundant of food, it’s the fact that the food offering is delicious, varied and filling. 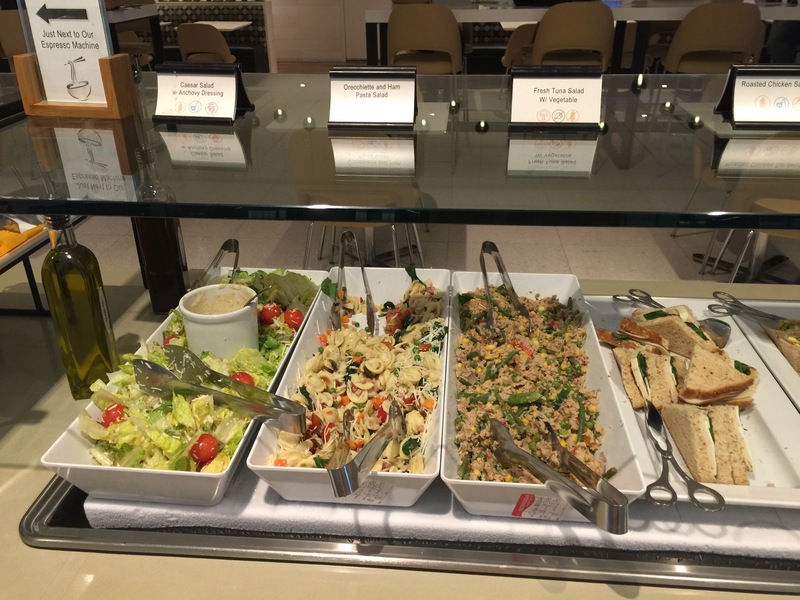 Therefore, you don’t have to worry about what food you might be served on the plane, rather, you can just enjoy the food at the lounge and be relaxed for your flight. If I’m ever lucky enough to enjoy access to the Star Alliance Lounge again in the future, I would never hesitate to stop in before my flight. This is definitely one of the best airport lounges I’ve ever been in.